Update (9:50 PM PDT Oct 30): Please note that, after reading your concerns, we will be making one additional change on November 8th. MSL Weapon's [Dungeon Hunter] buff's effective dungeon will change from Lubelisk to Ludibrium Clock Tower. This change will be applied to all players that currently have the weapon, as well as those that obtain it in the future. We've decided that this is a natural change, as MSL Weapons were meant to be gear targeted for one of Chaos Raids we intended to release in November. It has been an amazing three weeks since we officially launched on October 10th! While TwitchCon and Steam Halloween Sales were happening, we have been quietly preparing great content for the upcoming November update. Today, I would like to share important details of upcoming updates, including some of the hot topics within the community. Currently, we are aiming to deliver our first major content update on November 8th PST. The date could change depending on QA testing results! This update includes Chaos Raids, Thanksgiving events, and quality of life improvements. As many of you have been gearing up towards the Chaos Raids, we have been reviewing the structure of the system and making lots of adjustments for the global version. The biggest change would be that we are going to expand the daily/weekly cap for the raids vs. other regions, and we are not going to make extra raid tickets available at this time. Overall, we want players to be able to jump into Chaos Raid right away with reasonably upgraded epic gears. This means Shadow Altar will have the lowest Gear Score requirement of the three Chaos Raids, to allow you to obtain part of Legendary gear necessary to enter Moonlight Fortress. Ludibrium Clock Tower will have the toughest Gear Score requirement, which will require a reasonably upgraded Legendary gear set, sans weapon. As a result, we will be providing different types of drops based on the raids as well as different open times. We are going to have three different sets (pictured above), and each set will carry the same spec and Gear Score but will have different passives and triggers. We have put a lot of thought into the current progression and end-game design and came up with the above changes. Also, the daily/weekly limit for EACH raid will be 3 per day and 6 per week, and it is a character-based cap. Please look out for more detailed information with our November Update Preview announcement and detailed patch notes. As for additional raid entrance tickets, we are not selling them directly and will be reviewing how we would like to approach that going forward. This function is in Beta, meaning that based on how the feature performs we may take another action or remove the function from the service. This is not the end of changes related to our dungeon system, as we will continue to take feedback and review data sets to make decisions about the next steps. We are going to introduce a brand new Thanksgiving event! If you remember the old Thanksgiving event in MapleStory, you won’t be disappointed. 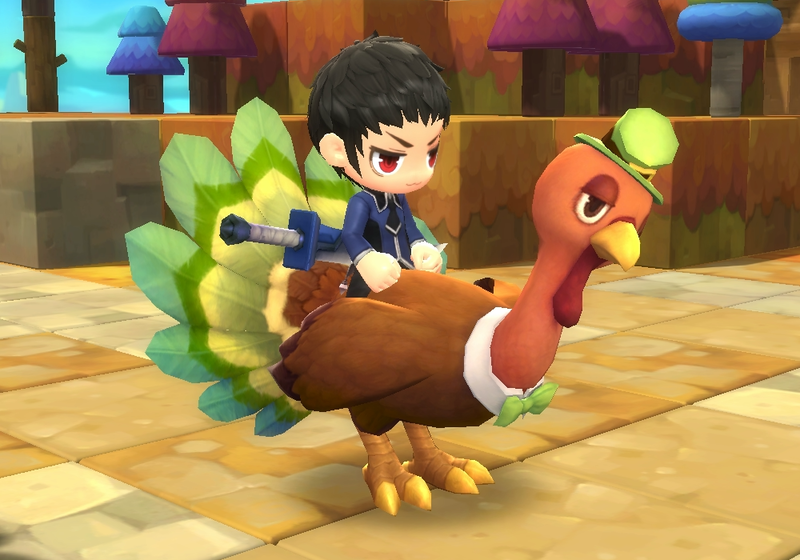 A wild turkey will be invading Maple World, and you will have many different activities to participate in to get cool rewards including an exclusive Turkey Mount! As we did with Halloween, you won’t need to spend any Merets to get cool-looking things from the event! Please look out for more details about the event! Prepping Players for the Chaos Raids This Week! With the double loot event, we have seen more players entering Hard Adventure Dungeons. On North America East server alone, we have seen 52% more characters now playing Hard Adventure Dungeons week over week. Thus, we believe now it is time for us to support players to gear up for the Chaos Raids, and we will be expanding the double loot event for the Hard Adventure Dungeons for the week! Also, we will be extending double loot for the Normal Adventure Dungeons for another week. Keep an eye out for more details on the event! Fairfight Change: As we discussed last time, we are going to introduce the Fairfight scaling changes in the November 8th update. 10053 Error Fix: We are still targeting November 8th for the fix, and will provide more information soon. UGC Change: We are still working on a few changes to the current system. We can assure you it won’t impact the general use of UGC, and our goal is to create clearer guidelines about what is and is not allowed on top of what is mentioned in the Terms of Service. We’d also like to ensure that the Design Shop works as a function of talented creators and designers to deliver creative, quality designs which can sell well on the shop, also providing more options for customization for all players. Since players can use templates to always be creative, we are going to adjust the Design Shop to be more of a great source with creative, quality customization options. Meso Sellers and Bots: We are continuing to improve our system and overall monitoring, and as a result we have been banning over 1,000 accounts per day. We have seen meso sellers aggressively promoting their sites using Ad Balloons and other spaces and we’re working on adding more measures to prevent these from happening in the future. We will be analyzing the pattern and will continue to evolve our system to block ad spammers and bots in dungeons. Game Optimization: This is a topic we are addressing with the MapleStory 2 studio on a regular basis. The team is aware and reviewing what can be done to further optimize the game. We don’t have any ETA on detailed optimizations but wanted to share that we are aware and we are not ignoring these issues! As I always emphasize, we are closely monitoring all of the feedback we see from all different channels. While some of the topics might have not been covered via Producer Blogs, that doesn’t mean we are not looking into those topics. We are prioritizing and trying to improve the service every day, and hopefully, players are feeling the changes with every update. Again, thank you for being an awesome community, and we hope to continue to grow the MapleStory 2 community together!